Remy Hair means the cuticles are facing in the same direction and intact, ensuring longer lasting quality. Choosing Remy Hair allows you to treat the extensions similar to your natural hair, but with less daily maintenance. Our Remy Clip-In Hair Extensions are carefully crafted by hand with the highest quality materials, allowing the hair extensions to fit comfortably and the colors that blend naturally for instantly believable results. Our Synthetic Clip-In Hair Extensions feature our signature Fiberlite Technology, designed to mirror the look, feel and weight of natural human hair. The synthetic hair fibers are heat friendly up to 320 degrees. Our hair colors are blended with multiple shades, creating a dimensional and natural result. Just like human hair, the fibers have both a shiny and matte appearance. This makes Fiberlite the most realistic synthetic hair extensions on the market. What type of hair does LOX use? Made with Double Drawn 100% Remy Human Hair; this is the finest quality extension hair available worldwide. Made with Heat Friendly Polyester hair fibers using our signature Fiberlite Technology. What is the difference between the Gold and Silver standard? Our hair is 100% Remy Juman Hair, lasting 3-6 months in the professional line, and up to a year for our clip-in hair extensions. Remy Hair means that the cuticles are facing in the same direction and intact, ensuring longer lasting quality. Our products are all specialty handmade, never mass produced. This allows LOX Extensions services to be the most believable and natural hair extensions on the market. LOXsynthetic hair features our signature Fiberlite Technology, designed to mirror the look, feel, and weight of natural human hair. The synthetic hair fibers are heat friendly up to 320 degrees. Our hair colors are blended with multiple shades, creating a multi-dimensional and natural result. Just like human hair, the fibers have a shiny and matte appearance. This makes Fiberlite the most realistic synthetic hair extensions on the market. What is the difference between synthetic and human clip-in hair extensions? The appearance of human clip-in hair extensions can be altered using hair dye, and synthetic hair extensions cannot be colored. Most synthetic clip-in hair extensions cannot be styled using heat tools, but with our Fiberlite Technology, you may use heat up to 320 degrees to change the style. When working with either synthetic or human hair extensions, we recommend using sulfate-free professional products only. To best maintain your extensions, use a heat protectant on the hair before using heat tools. Styles will last in synthetic hair even if they get wet; the only way to alter the style is with heat. Human hair style longevity will be similar to your natural hair, and can be altered with heat, water, and weather (sun, humidity, heat, dry climate). Should I purchase Synthetic or Human hair extensions? Follow our recommendations below to determine the best hair extensions for you. If the hair extensions are worn every day, they will last longer than synthetic hair. If you would like to change the color of the hair extensions. We recommend human hair if you like to change up the texture of your hair often. (Wearing hair straight one day, curly the next, then back to straight). Like your natural hair, human hair extensions’ style longevity and integrity will be affected by natural elements like humidity, moisture, heat and sunlight. Our human hair extensions come in all one length, and a professional stylist may be needed to blend in the hair extensions to your natural hair. Human hair extensions are a higher price point. If the hair extensions are worn every day, they will not last as long as human hair. Fiberlite Technology features style memory and is not affected by natural elements like humidity, moisture, heat and sunlight. Our synthetic hair extensions come pre-cut, styled, and colored, so there is no need to see a professional stylist to blend them into your hair. 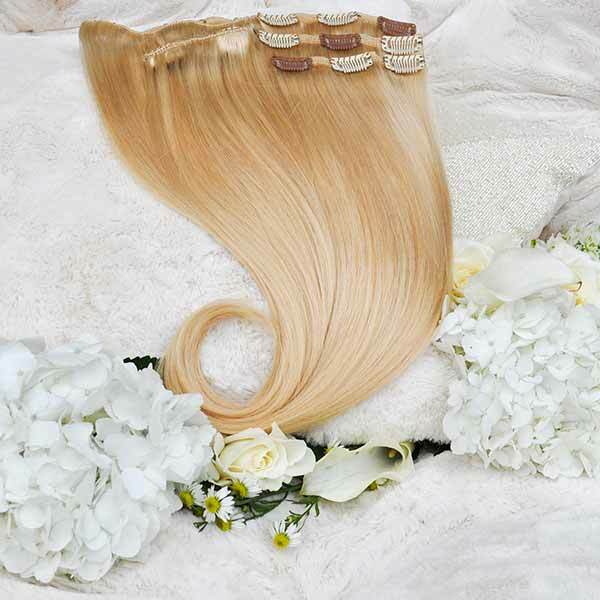 Synthetic hair extensions begin at a lower price point. What hair lengths does LOX offer? 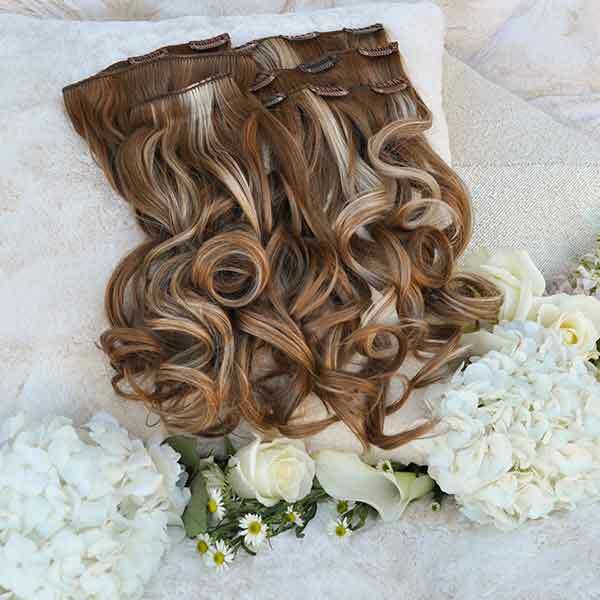 Our Remy Human Hair Clip-Ins are available in both 18 inch and 22 inch lengths. Our synthetic Clip-Ins and Hair Pieces are available in 8 inch, 12 inch, 16 inch, and 20 inch lengths. What makes LOX the best hair extensions on the market? LOX Extensions products are all hand crafted with only the highest grade materials, ensuring superior quality. Our creator works directly with hair extension wearers and professional hair stylists across the country. LOX Extensions are designed to have easy maintenance, damage-free application, and style versatility to fulfill the desires of women’s lifestyles.